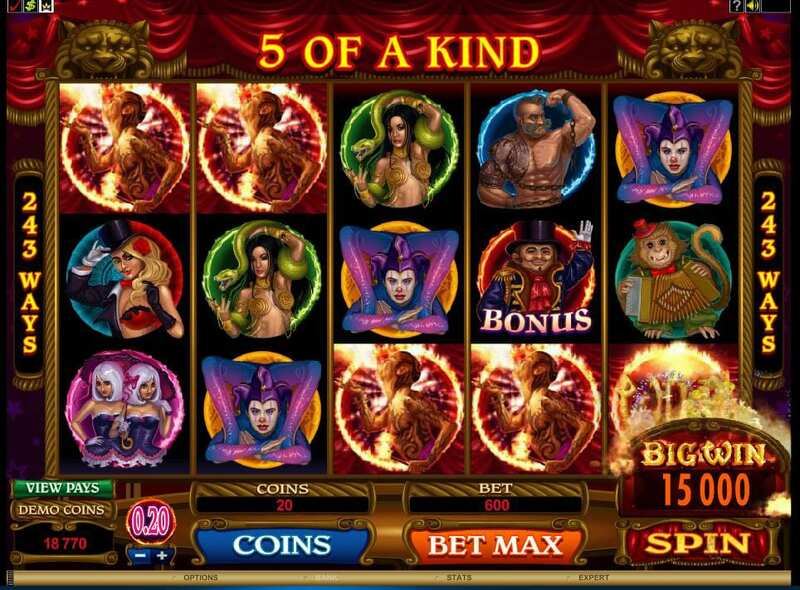 Here's a new game to us on Wizard, home of online slots. Roll up to The Twisted Circus for a show where anything goes, courtesy of the brilliantly warped minds at Microgaming. The ragtag bunch of characters that make up the reel symbols - including a bearded lady, strong man, snake lady and more - give players 243 chances to win, choosing to forgo pay lines for the more anarchic layout. The dark and demonic graphics and audio perfectly compliment the two bonus features - a Free Spin bonus and the Circus Match Bonus that make this game a spectacle well worth the price of admission. Founded in 1994, Microgaming is a development company who have always had big ambitions, beginning with establishing the first online casino in the world. Now boasting a stable of over 850 games played by online game aficionados around the world, Microgaming has brought innovation to every style of online game, from colossal progressive jackpots in Mega Moolah to converting the immensely popular Game of Thrones series into a similarly enthralling slot for would be dragon-slayers. In addition to developing quality online games, Microgaming has a long history of introducing innovation in sectors including a live dealer, multiplayer games, bingo games and sportsbook. Check out our video slots games from the same developer! When the red curtains open to reveal The Twisted Circus in all slightly unsettling glory, be ready to expect the unexpected. The lower payout symbols include a strong man, snake lady and a monkey, while the flaming Twisted Circus logo is wild and substitutes for all symbols except for the scatter ticket and the ringmaster bonus symbol. Before anything else, we recommend you to read more from our guide! Free Spins - Activate the free spins round by spinning three or more entry ticket scatter symbols. Once triggered, you will receive 13 free spins (lucky for some?) each with a hefty x3 multiplier. Free spins can be retriggered during the bonus, as well as the Circus Match Bonus. Circus Match Bonus - Spinning three ringmaster symbols on reels three, four and five will trigger the Circus Bonus Match feature. This pick and match style game gives players the chance to determine their own fate by picking pairs of charters and winning the prizes that correspond with that symbol. Find the wild symbols and win the total amount for all symbols. Enter the Twisted Circus on a variety of mobile devices (where bonuses look equally fantastic as their desktop counterparts) and formats. With a low stake limit of only £0.30 a spin, it’s easily worth the price of admission to try and beat the ringmaster. When you think of a circus you might imagine a lot of laughing and too many people trying to fit in an unsuitably small car, but it’s fair to say that Microgaming is not clowning around with this one. 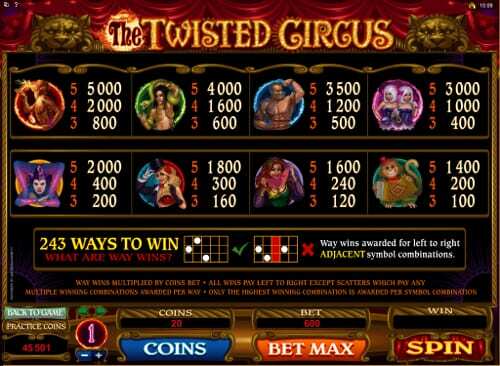 The Twisted Circus is as dark and enticing as it sounds, especially when the ringmaster ushers you into the Circus Match Bonus where locating wilds can result in heinously large payouts. Microgaming has showcased their gaming creativity once more with this highly entertaining yet twisted online slot, so roll up and don’t miss out on the action. If you liked The Twisted Circus then you might also like Goldwyn's Fairies.